With CBS All Access moving ahead at full impulse power towards the second season finale of Star Trek: Discovery, Deadline is reporting that two of season two’s big cast additions will be sitting out the next run of episodes. 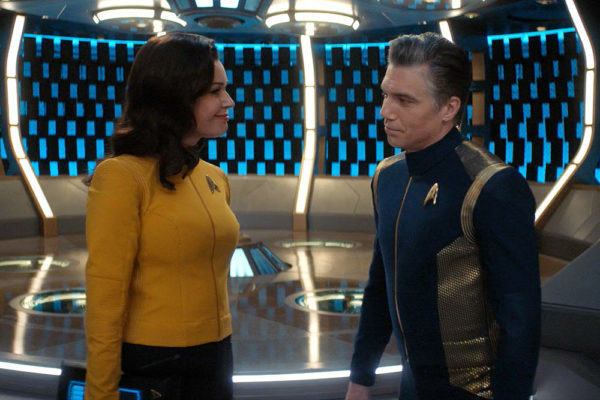 According to the site, there are no plans for Anson Mount and Rebecca Romijn, who play the classic Trek characters Captain Christopher Pike and Number One of the U.S.S. Enterprise, to return for the show’s third season. Deadline’s sources suggest that both actors had strictly one-year deals and were only contracted for season two as the producers looked to sync up Discovery with the continuity of Star Trek: The Original Series. In addition to the third season of Star Trek: Discovery, CBS All Access is readying for production on the as-yet-untitled Jean-Luc Picard series with Patrick Stewart, and is also working on two animated shows as well as a Section 31-themed Discovery spinoff starring Michelle Yeoh – although the latter is apparently “a good couple of years away”.